January 08, 2013, 11:00 p.m.
No self-respecting Washington policy wonk involved in the fiscal cliff negotiations can turn a blind eye to the public’s response to possible tax and spending changes. The public doesn’t always understand the terms being bandied about, though. Previously, I noted confusion about the payroll tax. An individual pays tax at a given bracket only for each dollar within that bracket&apos;s range. For example, a single taxpayer who earned $10,000 in 2012 would be taxed 10% of each dollar earned from the first dollar to the 8,700th dollar (10% × $8,700 = $870.00), then 15% of each dollar earned from the 8,701st dollar to the 10,000th dollar (15% × $1,300 = $195.00), for a total of $1,065. Notice this amount ($1,065) is lower than if the individual had been taxed at 15% on the full $10,000 (for a tax of $1,500). This is because the individual&apos;s marginal rate (the percentage tax on the last dollar earned, here 15%) is effected only on the portion of income exceeding that taxed at a lower bracket (here exceeding the first $8,350 of income taxed at 10%). Not everyone understands marginal rates though. Recently the New York Times joined the USAToday in making an embarrassing hash of marginal taxation by running an article in which a small business woman whose income was nearing the income threshold mused that she’d take home more money by stopping working so that she would not pass the income threshold for a higher marginal rate. NPR has also dipped its toe in the swamp of marginal tax inanity. 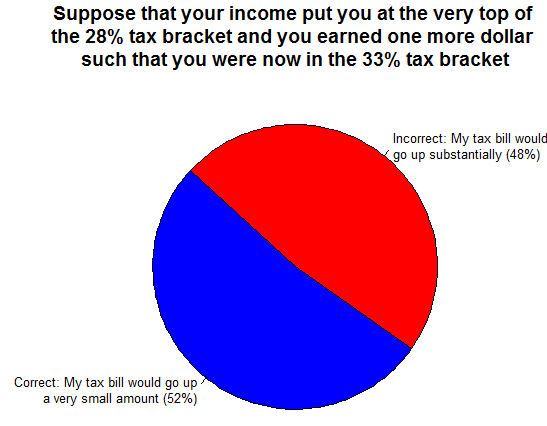 Respondents were given two options: a correct one (“My tax bill would go up a very small amount”) and an incorrect one (“my tax bill would go up substantially”). Only 52 percent got it right. The New York Times article was channeling the opinion of the many people who got it wrong. Who “gets it” on marginal taxation? The usual suspects for explaining variation in policy knowledge are education, income, political interest, partisanship, union membership and political knowledge. The data points directly at only one culprit. You guessed it: party. Democrats get it right and Republicans don’t. The figure shows the details. Democrats run about 25 percentage points more likely to get this answer right than Republicans (independents, not pictured, run 15 percentage points more likely to get it right than Republicans). The bottom line is that the informed conversation about tax rates is not the same conversation that many in the public hear. People seem to interpret questions about how the world works through a partisan lens. On this issue, Republicans seem particularly willing to believe the worst about taxes. Perhaps both sides are simply following implicit partisan cues, with Democrats willing to believe the best about taxes. 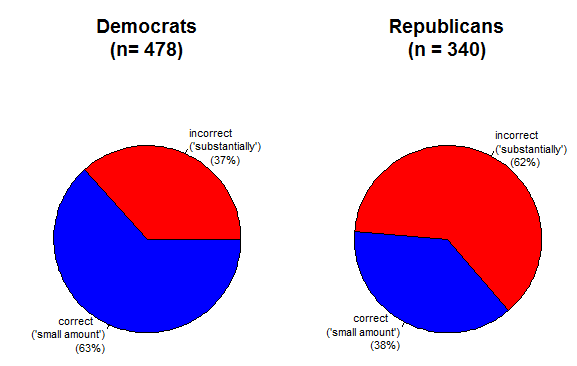 In fact, in a future post I’ll discuss an example where Democrats appear to be making a factual mistake. This makes the point starker: people aren’t responding to reality of what a policy is, but simply interpreting statements about how the world works as mere partisan chanting. This raises, to me, the question: what is the best way to break such a cycle? What messages from which messengers can break through to generate at least some basic factual knowledge?